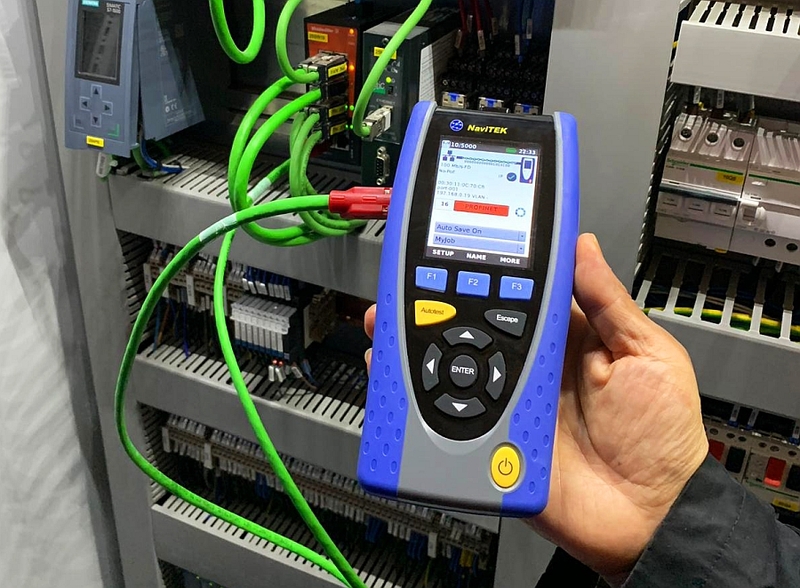 Ideal Networks has launched the Navitek IE, a portable network tester for commissioning, preventive maintenance and troubleshooting of Profinet industrial Ethernet networks as well as traditional Ethernet IP networks. The Navitek IE tester is designed to test fiber and copper cabling and industrial Ethernet networks operating under the Profinet protocol. It therefore does not require the use of a laptop computer with dedicated software to identify and test nodes and network configuration. The Navitek IE tester takes into account the physical differences between industrial Ethernet cabling and other networks. It is therefore possible, according to its manufacturer, to troubleshoot any part of the network with a single tester. 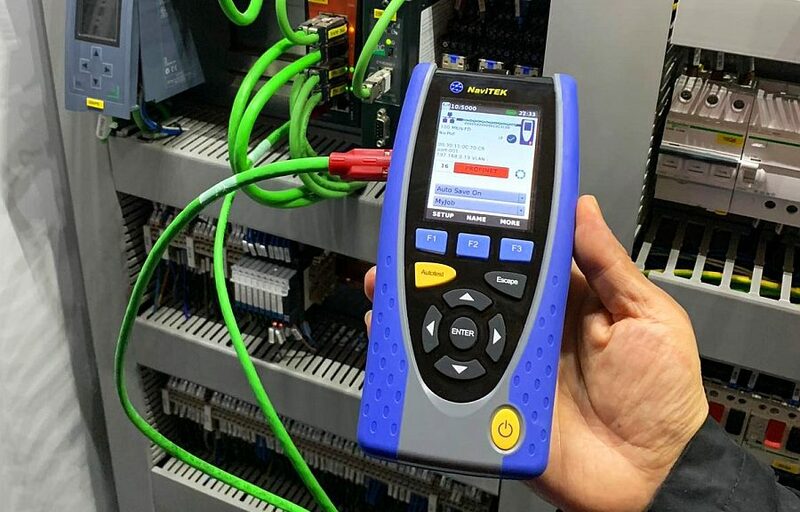 Equipped with a touch screen, the Navitek IE tester offers the same features as Ideal Networks’ Navitek NT Pro model, plus tools that meet the specific requirements of industrial Ethernet, for which packet transmission delay is essential for network operation. Navitek IE system checks, for example, can identify potential network failures before they spread. Color coding provides an indication of the performance status of each piece of equipment. Detailed information on the problems detected is obtained by clicking on a particular equipment. In order to avoid network shutdown due to wiring defects, Navitek IE tests various wiring diagrams to automatically detect equipment, network or wiring configuration and even defects. This tester also includes a time reflectometer (TDR) to determine the distance to the fault. It tests each cable on the data transmission cabling (not each pair) to isolate problems. It can also be customized to support standard and non-standard wiring configurations. For copper wiring, using the RJ45 or M12 connectors provided with the Navitek IE, the tester displays the correct wiring color for the protocol used. It also measures the length of the cable and determines where the fault is located and on which cable, including separate pairs, short circuits or open circuits and incorrect connections. For the fiber cabling test, the optional SFP module can be used to test the different wavelengths, measure the received optical RX power and identify defects on the cable such as dirty connectors, breaks or curvatures that exceed the allowed limit. Other features to help identify defects include incorrect device names, duplicate IP addresses, packet loss and latency issues. The instrument can also display and validate the network node information. Through the logbook, intermittent problems will be identified by recording events over 48 hours to determine if the problem is due to wiring, the node, the PLC or the network configuration. The Netmap test scans the network to identify all active devices. This mapping is named and saved so that it can be compared later with future Netmap tests performed. It is thus possible to detect added or removed equipment, poorly configured equipment, configuration changes such as those induced by automatic software updates. The Navitek IE also includes a feature, which, by flashing LEDs, allows you to locate hidden or mislabelled equipment. To validate the correct commissioning of the network, the tester generates test reports in PDF or CSV format that can be customized and shared via the free Ideal AnyWare mobile application.